If the title of this post gives you visions of bacon, it’s a safe assumption you don’t live in an area settled by Scottish immigrants. Hogmanay is the Scottish celebration of the New Year, dating back to the Middle Ages or perhaps even earlier. In Scotland, Hogmanay is celebrated with parades, concerts, and fireworks. Here, let me put you in the right frame of mind. You can pause to watch the pictures, or just listen to the 'pipes while you read the rest of the post. To be honest, I've never been much for New Year's Eve celebrations. To me, December 31 has always been just another day on the calendar. And I don't need a calendar these days to tell me I'm getting older, just a mirror. Ahem. But when we moved to this area, we discovered a family-friendly way to spend the afternoon. Our local Hogmanay in Portsmouth, Virginia, begins with a late-afternoon walk around the town. People wear tartan, bring their (Scottish breed) dogs, and follow the 'pipers in a parade to the waterfront. 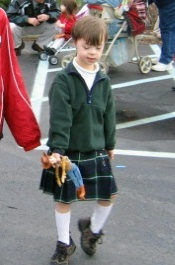 I snapped this picture of my younger son at the Scottish walk several years ago. Yes, it’s a real kilt, in Lamont tartan. My husband's maternal great-grandfather was born in Kilmarnock, Scotland. *Burns’ original Scottish is “my jo.” You might get strange looks if you get too authentic, so you’ll probably want to stick with the Americanized version of “my dear.” “Auld lang syne” means “old long since.” In other words, we’ll take a drink to remember old friendships and days gone by. The Hogmanay walk concluded, people retire to local eateries for food and musical entertainment. We usually trek to the pub which hosts a “session.” In Celtic music parlance, a session is like a pick-up band. Musicians bring their instruments and just start playing together—with no prior rehearsals! Here are some of the musicians from the Hogmanay session a year ago. 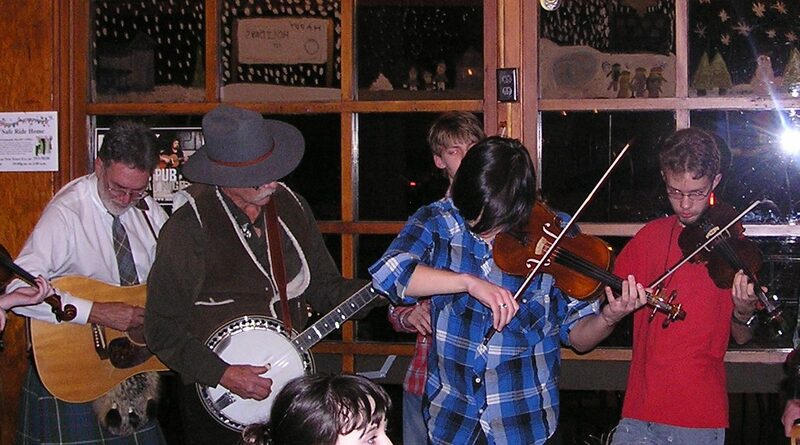 The fiddler on the right (in red) belongs to me. At a session, musicians play Scottish and Irish tunes. One person will suggest a song. Those who know it jump in. Those who aren't familiar with that particular tune either sit out that song or improvise a harmony part. It sounds impossible to me, but my son, in true Celtic fiddler fashion, is scary good at it. If you'd like to attend a session in your area (with or without an instrument), check this site for locations around the world. It's still early when the session ends, so it's time to partay! Well, maybe not for those of us with kids. We skip the more, er, effusive revelries and head home for a bit of oliebollen and Dutch New Year before shunting kids off to bed before the stroke of midnight. Dutch New Year? That's a subject for another post, of course. But we can't end a New Year's post without a nod to perhaps the most famous cinematic version of "Auld Lang Syne" ever projected on a screen. Do you have a New Year's Eve tradition? Or is December 31 just another day to you? I could cause confusion and ask which New Year you mean. The Ecclesiastical Year, The Regnal Year? The Financial Year- and which calendar Gregorian or Julian? According to my Latin Tutor there was more than one way of measuring the new year in the Middle Ages- and out calculations may be out anyway. I was musing upon the depictions of things Scottish in books. It seems to me that there are books set in Medieval Scotland in which the characters and culture seem more akin to what is seen as stereotypically 'Scottish' today. I mean it is doubtful whether kilts as we know them even existed in the Medieval period and many Medieval Scottish aristocrats might well have spoken French. CJ, I'm so glad you did this post. The really funny thing is that I was researching this very subject not very long ago, and learned about both the song and the celebration. And that was the first time I'd ever heard the term Hogmanay. This is the second. The reason I was researching it is because I wanted to understand the meaning of the song. Until then, I had no idea it was a poem written by Burns. I loved learning more about the celebration from you. I've always had a deep love for Scotland, bagpipes, and especially Scottish Terriers. I'd hoped to discover some Scottish ancestors someday, but the closest I've come is a great grandfather from Nova Scotia. Hogmanay came up last night on the Seekerville blog comments. I agree that things seem to settle down to what is essentially a new tradition of taking the favorite parts of the old. I've noticed this is Native American Pow wows and dancing. The difference in clothing and dance were at one time extreme but now, all ceremonial dancers wear the same gear. What happened is that they've taken 'what has survived' and 'what is most memorable' and that's probably the same thing we now look at with the definitive Scottish traditions. As for the calendar, I'm at a loss! thanks for stopping in Medieval Girl! CJ, I am in desperate need of a tall, handsome, dark-haired man to cross my threshold for 'first footing'. It may be awhile before any show up! Loved this version of Auld Lang Syne, and I am always thrilled to see your talented and adorable sons. It's nice that you live in such a heavily settled Scots area. Happy New Year to you, CJ! Suzie, this is going to be a great year for you! I've never heard of Hogamany, I must confess. We like to have a New Year's party. We do hats and noise makers and party poppers for the kids, snacks and toasts and kisses and watching the ball drop. We usually play games until we get closer to midnight. Suzie, you're welcome to come to our local Hogmanay. It's one of those everyone-is-Scottish-for-a-day events. I pretty much have to examine my family tree with a microscope to find anything Scottish -- but I had a collie growing up and now have a sheltie. Smart dogs, if a bit hairy. Deb, wish I could help you with the tall, dark, handsome visitor. If I find any, I'll be sure to send him along. Dina, when we were first married, my husband was shocked that I'd never watched the ball drop on NYE. I gave him one of "those" looks and said, "You do realize that where I lived, the ball dropped at 11:00?" And now, a confession. I wrote the post several days ago, and in the meantime, 3 guys in my house came down with colds (including the fiddler, who spent half the day in bed yesterday). We were going to do the walk/dinner with friends, and half their household also had colds. Somehow, the idea of walking around in the cold just wasn't appealing, so they came over to our house instead. We made oliebollen and wrapped up early. Fiddler was bummed. Maybe next year. CJ, so sorry the guys were sick. I hope you don't get it, too. My beloved dog of 13 years was a Scottie. Someday I will have another one, along with a Westie. I am thinking of doing a post on the different New Years too- and I really must get some more Latin practice in. There might be more pre-Christian survivals than we are aware of in various traditions or customs etc. Haggis I have never tried, so judgement I will reserve.... but I think I can identify with wondering why some things have survived. Morris dancing?